Situated at the northern part of the Tannan Bay tourist resort in Pingtan, Fujian province, Haitan Ancient City is a large cultural tourism complex built on an island featuring a large number of buildings built in ancient architectural styles, the first tourist attraction of its kind in China. 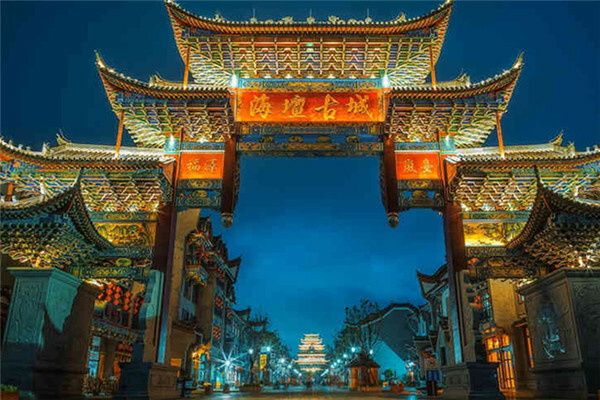 With an investment of 8.6 billion yuan ($1.4 billion), Haitan Ancient City occupies an area of 698,000 square meters and consists of more than 150 old-style buildings, most of them two- or three-stories high, housing restaurants, snack bars, five-star hotels and souvenir stores. It also serves as one of the most important cross-Straits cultural communication bases in Pingtan. Various cultures collide and dazzle tourists in Haitan Ancient City, where people can see Mindu Opera, Hakka snacks, a Matzu-themed temple fair and a Taiwan-style night fair.